I've been enjoying the recent upgrades to La Cumbre Plaza, Santa Barbara's oldest shopping mall (or "outdoor lifestyle center," if you like), which opened in 1967. And I don't necessarily mean adding upscale stores like Tiffany and Louis Vuitton to balance Sears and Claire's. The owners, who have changed twice in, I think, the past ten years, have been adding improvements to the shopping center: more plants, more seating areas, and generally making a more welcoming environment for shoppers. They've restructured the store facades (don't know how I feel about that) and created an ever-changing decorative garden space in front of Macy's that transforms each season. However, a large portion of the mall had been ignored for decades. This has now become part of the remodel, and I couldn't be happier. 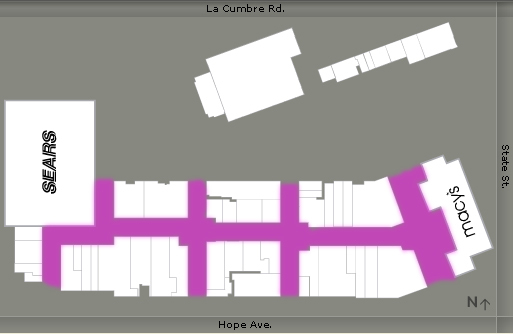 If you look at the image, you can see the walkways and courtyards shaded purple. This means that the vast majority of the property is parking lot. So the first thing you used to see when driving into La Cumbre Plaza was not beautiful facades, water fountains and potted plants, but the backsides of stores. No windows, no decor, mostly a fortress. This has all changed. Now when you drive into the parking lot, you see benches, potted trees, and even some display windows and storefronts, as the company has reconfigured some of the shops with front doors facing the parking lot. Believe me, I'm going somewhere with this. You may think that the moment you walk onstage is the first impression your audience gets of you. However, you are onstage from the minute you arrive at the venue. In fact, you are onstage when someone is browsing your website to determine if they want to invite you to speak! You are onstage when you're tweeting, Facebooking and LinkedIn-ing. Walking onstage is oftentimes your LAST opportunity to make a first impression. Your parking lot is what event organizers and some audience members see first. Is your website up to snuff? Or do you have generic stock photos, hard-to-find contact information and a sketchy bio? Do you respond to business e-mails and phone calls in a timely manner, or do you come across to prospects as unprofessional and unresponsive? When you walk in the door, are you harried and stressed out about getting yourself set up? Or do you smile, breathe, and take the time to chat with the organizer and early-arriving audience members? Do you wash your car before a speaking engagement? I don't have off-street parking and therefore, my car has the occasional dust, sap drippings and bird droppings that come with parking under trees. (Who am I kidding? It's more than occasional.) Every time I drive up to my venue in a dirty car, I feel like I'm representing myself poorly. Pay attention to the architecture and decor of every facet of your presence, in person, online and onstage. No matter where people are positioned, you should present a great view. When you get in front of your audience to speak, you should have already made positive first, second, third and fourth impressions. Customers don't always enter through the front door. Your front door is frequently the last thing seen. Don't waste the opportunity to impress your prospects and audience as early and often as possible.